I am sipping on my glass of local organic red and thinking how flavourful it tastes and suddenly wondering where and how it was made…(as one often does in these complex production times). I look at the Can Rich label prominently positioned on the bottle and decide to go visit the vineyard that is responsible for making this wine taste so structured and complex in flavour despite its relatively young age. I drive through the narrow, winding back roads in the direction of San Mateo village, turn in the direction of ‘Forada’ (a little market taking place every Saturday selling local produce and goods), keep winding until I am in Buscatells land and drive by a rather large property of bright green grape vines. I turn in at the Can Rich sign and am immediately struck by the colour of the soil, a characteristic dark orangey red, made more noticeable by the shiny green juxtaposed vines. I enter the bougainvillea strewn payes house, and into the local shop for a chat with Stella Gonzalez Tuells, a key player in the Riera family’s organic vineyard. We chat generally about the wine market and Stella starts to explain how 20 years ago there really wasn’t much thought about how wine was made in Spain and whether or not it contained sulphites and so on. The early 1990’s marks a period wherein there was an increased popularity in organic wines around Europe and thereafter in Spain. 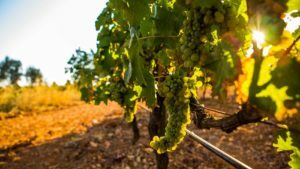 How long has Can Rich existed in Ibiza and why did the Riera family decide to enter the organic wine market? What differentiates Can Rich wine from other global organic wines available on the market? Is it fair to say that Can Rich has become part and parcel of Ibiza’s wine lifestyle? Is Can Rich able to produce a lot of wine and does it export? Which wines would you recommend our readers? I thank Stella and have a little more of a wander around the beautiful property thinking all the while how yet another successful Ibicencan rooted business has filtered its way into my daily life. I indulge in a little wine tasting and have one of their guided tours as to learn a little more about the production process. Soon after I buy a case of their Blanc de Blanc Extra Brut and rush on home to tell my family about my new discovery!